Offering our clients a wide range of Pressure Instruments that includes pressure gauge, differential pressure transmitter, thermo pressure gauge, pressure transmitter / transducer, magnehelic gauge, differential pressure switch, differential pressure gauge and pressure sensor. 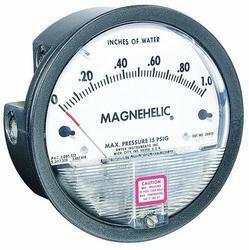 We are offering Magnehelic Gauge to our client. 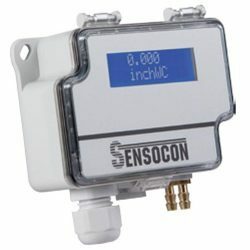 The Series DPT Multi-Range Differential Pressure Transmitter Sensocon was designed specifically for the building automation and HVAC industry. With field selectable ranges down to 0.1 inches w.c., this product is ideal for montioring building pressure, static pressure, differential pressure, or air velocity and flow. The Series DPT Differential Pressure Transmitter also has jumper selectable outputs for 4 - 20 mA or 0 - 10 V and unit selection giving additional flexibility. For a virtually maintenance free transmitter, order the optional automatic zero and the transmitter will perform its own zero point maintenance. 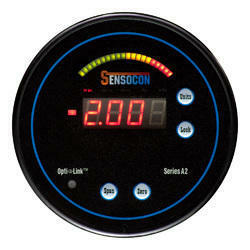 The Multi-Range Differential Pressure Transmitter also has an optional backlit LCD for giving local indication. We are offering Digital Differential Pressure Gauge to our client. The M5100 series pressure transducers from the Microfused(TM) line of MEAS, set a new price performance standard for demanding commercial and heavy industrial applications. This series is suitable for measurement of liquid or gas pressure, even for difficult media such as contaminated water, steam, and mildly corrosive fluids.The transducer pressure cavity is machined from a solid piece of 17-4 PH stainless steel. The standard version includes a 1/4 NPT pipe thread allowing a leak-proof, all metal sealed system. There are no O-rings, welds or organics exposed to the pressure media. The durability is excellent. The M5100 exceeds the latest heavy industrial CE requirements including surge protection, and is over voltage protected to 16Vdc in both positive and reverse polarity. This product is geared to the OEM customer who uses medium to high volumes. The standard version is suitable for many applications, but the dedicated design team at our Transducer Engineering Center stands ready to provide a semi-custom design where the volume and application warrants. The M5100 series pressure transducers from the Microfused(TM) line of MEAS Pressure Transmitter, set a new price performance standard for demanding commercial and heavy industrial applications. This series is suitable for measurement of liquid or gas pressure, even for difficult media such as contaminated water, steam, and mildly corrosive fluids. The transducer pressure cavity is machined from a solid piece of 17-4 PH stainless steel. The standard version includes a 1/4 NPT pipe thread allowing a leak-proof, all metal sealed system. There are no O-rings, welds or organics exposed to the pressure media. The durability is excellent. The M5100 exceeds the latest heavy industrial CE requirements including surge protection, and is over voltage protected to 16Vdc in both positive and reverse polarity. This product is geared to the OEM customer who uses medium to high volumes. The standard version is suitable for many applications, but the dedicated design team at our Transducer Engineering Center stands ready to provide a semi-custom design where the volume and application warrants. The M5100 series pressure transducers from the Microfused(TM) line of MEAS Vacuum Transmitter, set a new price performance standard for demanding commercial and heavy industrial applications. This series is suitable for measurement of liquid or gas pressure, even for difficult media such as contaminated water, steam, and mildly corrosive fluids.The transducer pressure cavity is machined from a solid piece of 17-4 PH stainless steel. The standard version includes a 1/4 NPT pipe thread allowing a leak-proof, all metal sealed system. There are no O-rings, welds or organics exposed to the pressure media. The durability is excellent. The M5100 exceeds the latest heavy industrial CE requirements including surge protection, and is over voltage protected to 16Vdc in both positive and reverse polarity This product is geared to the OEM customer who uses medium to high volumes. The standard version is suitable for many applications, but the dedicated design team at our Transducer Engineering Center stands ready to provide a semi-custom design where the volume and application warrants.